Cobbles and Clay01535 958961work CafeBesides serving fresh, tasty food and drink, we aim to make your visit to Cobbles and Clay a truly unique experience. We provide you with a choice of unglazed pottery, which you paint in your own design and then we'll glaze it for you in our kiln so it can be kept forever. Ideal venue for adult and childrens parties. 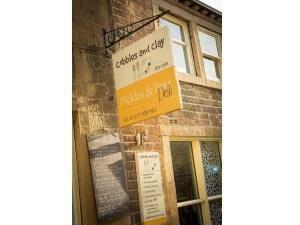 Besides serving fresh, tasty food and drink, we aim to make your visit to Cobbles and Clay a truly unique experience. Licensed. Children Welcome. Patio Garden. Pottery Painting. Credit Cards accepted. Capacity 32. Open 9.00 - 17.00 daily. Opening times can change at short notice, please call in advance if you are making a special visit.